Mounted skeleton of Lystrosaurus murrayi in the Muséum national d'histoire naturelle, Paris, photographed by FunkMonk. The Dicynodontia are a group of herbivorous synapsids known from the the Late Permian to the Cretaceous, though they did not survive past the Late Triassic outside Australia. At their peak, they were the world's dominant herbivores. 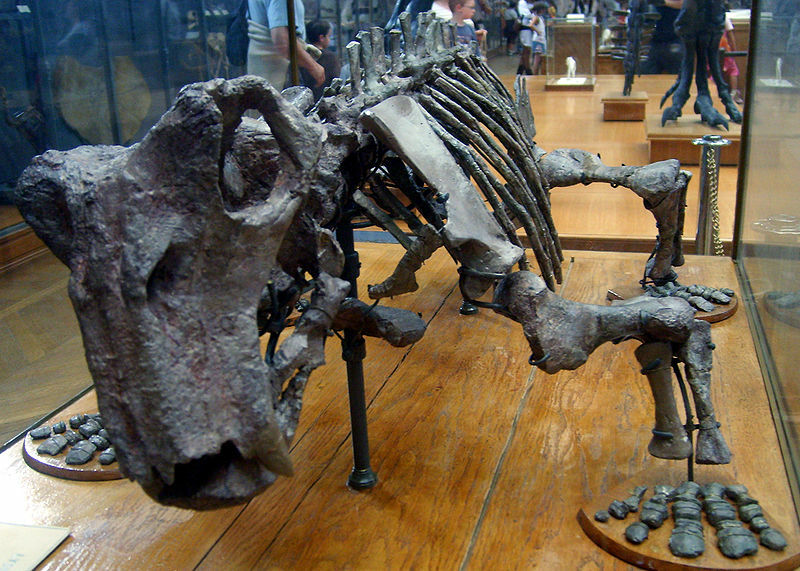 One genus, Lystrosaurus, included the most abundant terrestrial vertebrates in the earliest Triassic immediately following the end-Permian mass extinction. The name 'dicynodont' refers to the pair of large tusks that were generally the only teeth in their beaked jaws. Synapomorphies (from Kemp 1988): Zygomatic arch dorsally displaced; dentaries fused at symphysis; articular surface of lower jaw sloping posteroventrally; horn developed on the jaws; intramandibular fenestra present; premaxillary secondary palate present. [M00] Maisch, M. W. 2000. Observations on Karoo and Gondwana vertebrates. Part 2: A new skull-reconstruction of Stahleckeria potens von Huene, 1935 (Dicynodontia, Middle Triassic) and a reconstruction of kannemeyeriiform phylogeny. Neues Jahrbuch für Geologie und Paläontologie Abhandlungen 220 (1): 127–152.